Do you want a new property management website by the weekend? Our Rapid Start option gives you a stunning, property management focused website that can be live within a few days. As with all of our website options, it includes the ability to fully customize to your heart's content; the customization options are truly infinite. 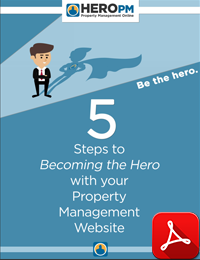 Do you have an existing HERO PM website, and you are looking to upgrade to a v5 Website using a Rapid Start template? You can do this easily, and then customize the new website exactly as you wish. This $95 upgrade option is available to members with an existing Rapid Start website, through your Control Panel - Configuration - Orders & Upgrades - Order a Website Upgrade. Preview the current Rapid Start template styles below. Again, you may customize each of these in any and every way.